Music teaches discipline and creativity, skills that can assist students with academic success. The Music Department at Vernon Middle School is giving rise to student ingenuity and proficiency through music education. The Vernon Music Department consists of band, choir, and orchestra classes offered to students from sixth to eighth grade. Vernon is helping develop great musicians by instilling the love for music in all of their students. Students are able to develop and expand their creativity and other skills in a close-knit community. 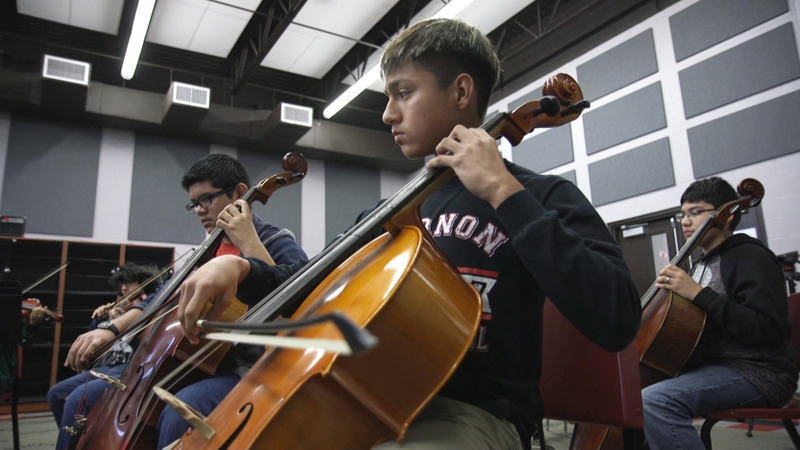 By perfecting their technique on a brass, woodwind, string, percussion or vocal instrument, students are developing mental and sensory skills to help them become better musicians and better learners in other classes. And for eight-grader Oscar Dominguez music has even made him more confident when learning new information. Band, choir, and orchestra students learn the importance of applying themselves not only in music class but in the academic world too. They are aware that in order to keep participating in music, their grades must remain a top priority. “You just have to focus on the teacher, learn, and get good grades. If you get good grades, you succeed,” eighth-grader Nathan De Leon said. From the moment sixth graders enter their first music class to their performance as seventh and eighth-grade students at concerts and competitions, music teachers observe the development of young students into great musicians and scholars.